Find the best places for Cyprus camping and a list of Cyprus campsites on Aphrodite's island. If you're an outdoor lover like me, then you probably like camping too. I mean what better way to experience the great outdoors than to pack some gear in the car, some good food and wine and head for the hills? Most people think of the coast if they want to camp, and the coastal campsites like the one at Polis beach, are very popular in high summer. But if you want a little more peace and quiet, and, in my opinion, far better scenery, head for the mountains! The air is so much cooler above 800m and you will sleep far far better inside your Cyprus camping tent in the fresh air of the mountains. Although the coastal campsites are quite popular in the hot summer months, as a general rule, camping in Cyprus isn't that common. And surprisingly so, perhaps as there are actually more campsites in Cyprus than you might think. c) It's free to stay there (well we weren't charged anyway) AND there are facilities like a cookhouse, showers, toilets and fresh running water from the natural mountain stream. The Stavros site has several flat levels, specifically for the tents, and the wash house and cook house are adjacent and below. There's also a BBQ area for absolute safety to prevent any forest fires. 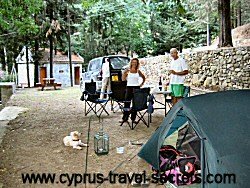 Here's a complete list of Cyprus campsites. Polis campsite on Polis beach. Space for 200 tents/caravans. Open March-Oct. Price: 2.56 per person per night plus 3.42 per tent. Tel: 26815081. Fegarri campsite located in Coral bay, 11km north of Paphos, close to Coral Bay beach. Open all year. Space for 47 tents/caravans. Price: 4.27 per person per night plus 2.56 per tent/van. Tel: 26621534. Troodos Camping. Situated in the pine forests 2km north of Troodos resort on the Kakopetria road. Open from May until the end of October, weather permitting. 5 per day for 2-3 people, 31 for a week. 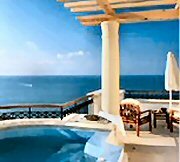 Tel: 25420205. Stavros Forest station - site has space for around 25 tents and full facilities as mentioned above plus picnic tables. There is supposed to be a nominal charge but we didn't pay anything for one night and it's quite simply serene and beautiful. Beware of flies, however, and bring plenty of insect repellent! Open all year if you fancy camping in the snow during winter! Price: 1 for 1 tent, 2 for 2 people. Tel: 26991860. Kampi tou Kalogirou - another forest campsite in the Troodos run by the Forestry department, this campsite has six toilet blocks but no showers. Located 4km from Trooditissa and 3km from the Troodos village of Prodromos. Price: 2 per person. Tel: 25422625. NB - this campsite was recently visited by a resident in Limassol and the site is littered with permanent caravans and lots of rubbish. Best avoid this one and head for one of the other sites. Platania campsite in the forest has 18 toilet/shower blocks with kitchen facilities as well as disabled facilities and picnic tables. There are kids' play areas and near the campsite there is a canteen selling most kiosk type products. Located 5km from the village of Kakopetria near the Platania forest station. Price: 5 per night for two people. Tel: 22924225. Charges for cyprus camping above correct as at June 2011, but may be subject to change. Tip: While the campsites have shower facilities, the water isn't always running in the more remote ones like Stavros. Take some wet wipes with you!